The lowly Arduino, an 8-bit AVR microcontroller with a pitiful amount of RAM, terribly small Flash storage space, and effectively no peripherals to speak of, has better speech recognition capabilities than your Android or iDevice. Eighty percent accuracy, compared to Siri’s sixty.Here’s the video to prove it. This uSpeech library created by [Arjo Chakravarty] uses a Goertzel algorithm to turn input from a microphone connected to one of the Arduino’s analog pins into phonemes. From there, it’s relatively easy to turn these captured phonemes into function calls for lighting a LED, turning a servo, or even replicating the Siri, the modern-day version of the Microsoft paperclip. There is one caveat for the uSpeech library: it will only respond to predefined phrases and not normal speech. Still, that’s an extremely impressive accomplishment for a simple microcontroller. This isn’t the first time we’ve seen [Arjo]’s uSpeech library, but it is the first time we’ve seen it in action. When this was posted months and months ago, [Arjo] was behind the Great Firewall of China and couldn’t post a proper demo. Since this the uSpeech library is a spectacular achievement we asked for a few videos showing off a few applications. No one made the effort, so [Arjo] decided to make use of his new VPN and show off his work to the world. 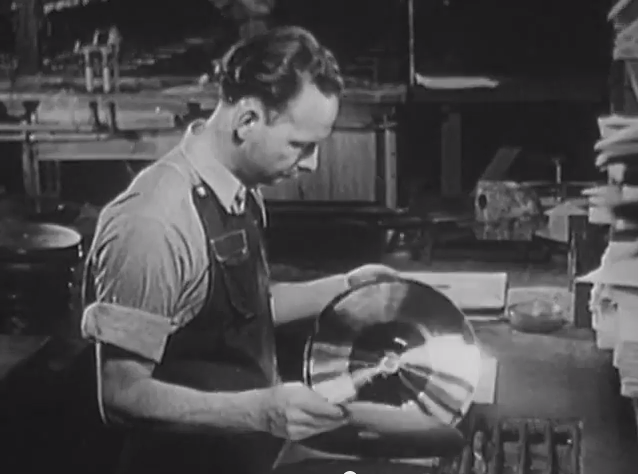 In this 1942 tour of the RCA Victor plant in Camden, NJ, we see the complete record making process from the master cut production to the shipping of multiple 78RPM shellac pressings. The film centers around a recording of Strauss’ Blue Danube waltz as performed by the 1940s equivalent of studio musicians, the Victor Salon Orchestra. The master record starts life as a thin layer of molten wax poured on to a hot circular plate in a dust-free room. Bubbles and impurities are blow torched out, and the wax is left to cool under a steel dome. This perfect disc is carefully passed to the recording studio through a special slot, where it is laid carefully beneath the cutting stylus. Unlike today’s multi-track recording sessions, the master was cut from the performance of a complete band or orchestra all playing as they would in concert. The sound engineer was responsible for making fast changes on the fly to ensure sonic and groove width consistency. After cutting, the delicate wax undergoes several phases of electrolysis that form the metal master. It is bombarded first with pure gold and then twice with copper sulfate to build a sturdy disc. The copper ionization process also ensures high fidelity in the final product. Although mighty, this master won’t last long enough to make all the necessary pressings, so a mother matrix is made. This is a negative image of the master. The mother is formed by electrolytically bathing the master in nickel, and then adding a thin film of some indeterminate substance. Another copper bath, and mother emerges. As soon as possible, the master is separated and whisked away to the storage vault. Since a positive image is needed for pressing, a stamping matrix is made. Mother gets a nickel bath for durability, and then a copper bath to form the stamping matrix. Many stampers are created so that several records can be pressed at once. These images get a chromium plating to help them last through many pressings. Ideally, technology is supposed to enhance our lives. [Shane and Eileen], two seniors at Cornell have found a great way to enhance the lives of visually impaired individuals with their acoustic wayfinding device. In brainstorming for their final project, [Shane and Eileen] were inspired by this Hackaday post about robots as viable replacements for guide dogs. They sought to provide wearable, hands-free guidance and detection of (primarily) indoor obstacles—namely chairs, benches, and other inanimate objects below eye level. The wayfinder comprises two systems working in tandem: a head-mounted navigation unit and a tactile sensor worn on the user’s finger. Both systems use Maxbotix LV-MaxSonar-EZ0 ultrasonic rangefinder modules to detect obstacles and vibrating mini-disc motors to provide haptic feedback at speeds proportionate to the user’s distance from an obstacle. The head unit uses two rangefinders and two vibrating motors. Together, the rangefinders have a field of view of about 120 degrees and are capable of detecting obstacles up to 6.45 meters away. The tactile sensor comprises one rangefinder and motor and is used in a manner similar to a Hoover cane. The user sweeps their hand to detect objects that would likely be out of the range of the head unit. Both parts are ergonomic and size-adjustable. At power up, [Shane and Eileen]’s software performs a calibration of the tactile sensor to determine the distance threshold in conjunction with the user’s height. They’ve used an ATMega 1284 to drive the system, and handled real-time task scheduling between the two subsystems with the TinyRealTime kernel. A full demonstration video is embedded after the break. Are you good at mixing drinks? We think this Barbot might give you a run for your money! Not only does this Barbot have room for 5 different liquors, but you can combine them any way you want with an extremely slick web interface that you can check out for yourself. During initial setup, you add your chosen liquors to the machine and then using the configure mode in the web interface, you tell Barbot what it has to work with. Once these fields are populated, Barbot will list various drinks that it is capable of mixing with the provided ingredients. It also has a cleaning mode, which allows you to prime the pumps and set administrative access for your parties. The hardware behind this build is a BeagleBone Black running Ubuntu 13.04 with Apache2, MySQL, and PHP to host the web interface — bind and DHCP are used to create the web portal using a USB WiFi dongle. The online interface directly controls the pumps using PHP via the GPIOs. To see a full demonstration stick around after the break for the included video.